This is Dragon multi cartridge version 1.6 (currently v1.64) for Dragon (TANO) 32/64. It is a minor update of version 1.5. Functionally the same, but a little bit smaller. Display and controls now are in horizontal orientation. The PCB is mounted onto a solid aluminum plate, which makes it rugged and provides a stable seat in the slot, even when operating the controls. 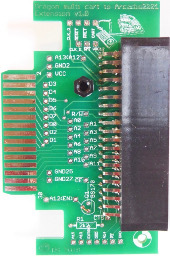 The dimensions are small enough making it possible, to build the cartridge into a standard ATARI VCS/2600 shell. This device is exclusively designed for cartridge ROM programs, not for cassette or floppy disk programs. It holds up to 64 8k (or 4k/2k) ROM images. It also can store 16k ROM images on adjacent slots. 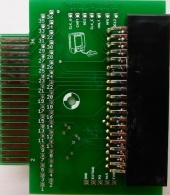 The cartridge uses a single 27C4001 EPROM (512 kBytes). ROM images are selected by setting two 16 position rotary switches. A two digit LED display shows the number of the selected image (00 ... 63). Autostart can be switched on and off. An additional switch combines the selected even numbered slot with the following one, providing a 16k slot for larger images. and the program will launch immediately. I successfully tested all the ROM images of this archive. Most of the CoCo ROM images of the archive are running. Some have to be adapted a little bit, to make them Dragon-compatible. For a list of compatible/modified ROMs please take a look at the forum (->Hints and Tips - Introducing: Dragon multi-cartridge (version 1.0) for ROMs). Modified ROMs can also be found in the forum (->Uploads). The Dragon/CoCo Multi-cartridge can also be used for other systems. Currently there are Extension Cartridges (adapters) available, which make the cartridge compatible with the VECTREX video game console, with the Odyssey 2/PHILIPS G7000/G7200/G7400 consoles, with the INTERTON ELECTRONIC VC 4000, with the 1292 Advanced Programmable Video System family, made by RADOFIN, ACETRONIC, PRINZTRONIC, HANIMEX, FOUNTAIN etc... and with the Emerson Arcadia 2001 family and its many clones. A compilation of rom-files for all the systems can be burned on a single eprom, adding versatility to the device. There are threads in the forum (->sale) showing pictures and giving more information about those add-ons. One multi-cartridge for six systems. What is a Dragon/CoCo Multi-cart? 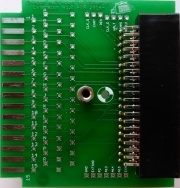 The Multi-cart was designed to to hold a variety of Dragon/CoCo rom cartridge based programs, which are running directly from the eprom at address range $c000 to $ff00. The cart holds up to 64 8k-roms. It can play roms with a size of 1k to 16k. You simply select a memory slot from 00 to 63, press RESET on your Dragon, and the program launches. This enables you, to use your Dragon simply without further hardware setup: no cables, no drives, no extra PSUs, no controller-carts. How about disk or floppy programs? Do not run unmodified on the Multi-cart. In many cases, a little loader routine can be put in front of the file, which copies the program from eprom to it’s proper ram-address range and launch. Reloaders are not working this way. Often the first part of the program is just the title screen, which is loaded into video-ram. In this case, this can simply be omitted and the procedure works again. Why did you make the cartridge? I was looking for one a few years ago, couldn’t find one, made one myself. Why are there different versions of the Dragon/CoCo-Multi-cartridge? I started with version 1.0, using my components in the drawer, learnt some lessons and made version 1.5, realized some improvements and made version 1.6. Then v1.61 and v1.62 with little changes. Is there a shell available? No, I changed the dimensions two times. I am mounting the pcbs on protective metal bottom plates. This is sufficient and fits nicely into the Dragons cartridge port. For people, who absolutely want a shell, I recommend to use recycled ATARI VCS cartridge shells and physically modify them with an electric drilling tool, to adapt them for the Multi-cart. What are these Extension cartridges? Simply adapters/interfaces which you plug between your Odyssey2, Vectrex, INTERTON, 1292 console, Arcadia 2001 console and the Dragon/CoCo Multi-cart. This enables you to use your Multi-cartridge on different systems, which makes it a quite cost-efficient solution. Do Extension-cartridges store programs, too? No. They are only interfaces. Which Extension-cartridges are out there? At the moment Odyssey 2 (Videopac), Vectrex, INTERTON ELECTRONIC VC4000, 1292 AVPS and Emerson Arcadia 2001. More to come? Maybe yes, from time to time. Why should I buy a Multi-cart plus an Extension-cart, when I can have dedicated cartridges for all systems? Buy what ever fits your needs the best. If you already own a Dragon/CoCo Multi-cart, then the extensions are expanding your possibilities to use your cartridge. It's a cheap solution which you can for currently six systems, if you swap eprom and extension. Why do you use eproms instead of a SD-card? I like eproms: they are cheap, easy to put into applications and easy to operate - and very „retro“. Every retro-fan should have an eprom-burner and an UV-eraser. These are cheap tools (on ebay for example) and can be used for all kinds of old computers. Making SD-card based devices is more complicated and usually makes these devices more expensive. Whereas SD-cards are quite useful on dynamic systems, which are getting new software all the time, eproms are good for older systems with a more or less static and limited software library. Will you never make an SD-cart-based Multi-cart? Maybe sometimes. I don’t know. What programs are initially stored on the Multi-cartidge, when delivered? None. Since I do not know the legal situation of all those roms and do not know, which licenses you own, I better deliver an empty eprom. Decide yourself, which roms you may copy and which still are legally protected. How do I get programs on the cartridge? 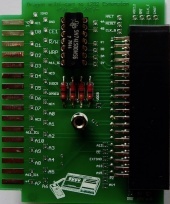 You need an eprom programmer like the well-known Willem-programmer or any other device. You find plenty of those on ebay. Consider, that some devices need a genuine parallel printerport, which unfortunately passed into oblivion on modern PCs. So maybe look for an USB-only programmer. The programmer burns a single, exact 512k-file (512 x 1024 = 524288 bytes) onto the eprom. You make sure that all program roms are exact 8k or 16k, this means, with the help of an hex-editor you might have to pad zeros at the end of a file. Most roms already have a correct length. Or multiply small files to get 8k-files, i. e. concatenate a 2k-file four times to get an 8k-file and save it. How is concatenating done? On Mac and Linux systems there is a standard shell-command: cat file1.bin file2.bin … filen.bin > result.bin. On Windows there is an ancient DOS-command: copy file1.bin + file2.bin + … + filen.bin result.bin. You simply concatenate exact 8k- or 16k-files until your result.bin is 512k. Take care, that 16k-files are aligned to even 8k-slots. It’s simple and fast. I’m normally making intermediate files first, consisting of eight 8k-roms (64 kbytes). I’m doing this eight times and finally concatenate the eight intermediate files to the final binary. This make debugging and changing roms a lot easier. How do I get rid of programs into my cartridge? Put your eprom into an UV-eraser box for 15 to 20 minutes. Can I mix roms of different systems on the same eprom-chip? Yes, any order you like. What happens if the BANKSIZE-switch is in the wrong position? Position 16k: Small programs, no effect. But you can’t access the odd rom-slots, only even slot-numbers. Position 8k: Large programs won’t work properly. How do I remember, if a rom is 8k or 16k? Write a list, a table of content. What’s the use of the AUTOSTART-switch? Dragon/CoCo only: It’s activating/deactivating the autostart feature. For games autostart is fine, but for some development tools memory must be cleared manually before launching. Which direction do I plug the cartridges in? All cartridges and extensions are always facing up (components and labels on top) or when plugged in vertically, facing to the front of the console. What happens if I plug it in, in the wrong direction? Errrgh, don’t do it. What happens, if I selected a wrong rom of another system? No damage. Dragon/CoCo usually crashes. Vectrex runs inbuilt MINESTORM, instead of cartridge game. Odyssey2 does not show „SELECT GAME“, but garbles screen. INTERTON is simply not working. 1292 AVPS is simply not working. Arcadia 2001 is simply not working. Do you have plans to cancel the project soon? No. As long as people are buying cartridges from time to time, I try to always have the needed parts and components at home or produce a new version.